Profiles compiled with VFL List Manager Nick Byrne. "Fraser is a talented young utility who marks the ball well and will contribute in a variety of roles. He showed promise with a very strong Collegians side in the VAFA in 2017, and has made significant physical improvements in his time with our program so far. That help him in the step up in competition and assist him showing his football talent." "Louis comes from the TAC Cup system and has shown an ability to adapt to a new program, making significant physical improvements. Louis kicks the ball well and despite his age, has already shown an ability to influence training sessions and game simulation with his kicking and decision making." "Lewin played TAC Cup football for Bendigo and in 2018 moved to Port Adelaide in the SANFL. He has good goal sense, provides pressure as a forward and can also play as a defender." "Jordan put together a significant career in the NEAFL with Canberra Demons. As a former captain at state league level, Jordan has already shown his significant leadership talent and attention to detail in his preparation, which will benefit the program significantly on and off-field. Jordan will play in numerous midfield roles in 2018, which we hope will add to his significant skill set. Jordan is part of the leadership group in 2018." "Cam arrives from St Kevins in the VAFA and has impressed with his speed, technical proficiency and ability to play a range of positions. Cam will be available for selection as a 23rd player." "Nick is a former Gippsland Power player from the TAC Cup. He possesses excellent acceleration and lateral movement and both midfield and mid-forward traits and has shown good energy and willingness to work in our training sessions and glimpses of some game changing talent in match simulation." "Nash is formerly a Gippsland Power and Vic Country representative and most recently Essendon VFL-listed player. He’s combative, has a terrific motor and a significant talent base that we think can assist the team as a midfielder and as a forward. Nash will form part of the leadership group, and we look forward to developing his football and leadership potential." "Tom is a young player who has been playing local football in Ballarat and showed some promise very early in the pre-season. A natural athlete and another good runner, he’s got some good football traits and has adapted very well to all aspects of the program given his inexperience." "Chris arrives from Central Districts in the SANFL, where he was a high performing midfielder in a very strong competition. He’s another player who is adaptable in terms of his role, and he’ll provide another option for the coaching staff in a range of positions, an opportunity which will round out his already significant skill set. Chris is part of the leadership group and will take up a part-time coaching position, an experience that will also assist in his football development." "Ty had two years at Sydney, after being drafted in 2015. He brings a variety of excellent football traits, and is already a popular part of the footy club. Like Michael Close, Ty’s experience on an AFL list will assist our players who have come into a VFL program which is a significant step up from their previous football experience. Ty is another who will likely play in positions that will be new to him, but his speed, agility and kicking quality will see him provide assistance to the team in any role and another flexible option for the coaching staff." "Jordan is from QAFL club Wilston Grange and arrived from Queensland with an attitude that will see him advance in his football career. His significant improvement in his endurance is testament to his work ethic and hunger to play football at the highest level possible. Jordan has good football instincts and kicks the ball particularly well." "Brodie is a tall forward/defender who had an excellent season in the strong VAFA Premier Division. It’s hoped he’ll develop into a flexible forward and defender." "Lachie is from Redan FC in the strong Ballarat league and had some excellent performances for a player of his age in that competition. Lachie will be available to play as a 23rd player." "Liam is a strong, physical midfielder or forward who will add aggression and flexibility to our group." "Lachie has been very unlucky with injury in years previous, but impressed everyone very early with his work ethic, commitment to training and improving his skill set. He’s 200cm, has a strong frame and has impressed in match simulation." "Quintin is another who comes to us from the TAC Cup system, playing his 2017 football with the Sandringham Dragons. He’s an outstanding runner, can play in a few roles through the midfield and has shown some very strong signs in his time in the program so far. He has the usual strength improvements to make of a teenage player with a naturally light frame, but he’s already made significant strides in this area and has the natural footballing talent to rival his athletic strengths." 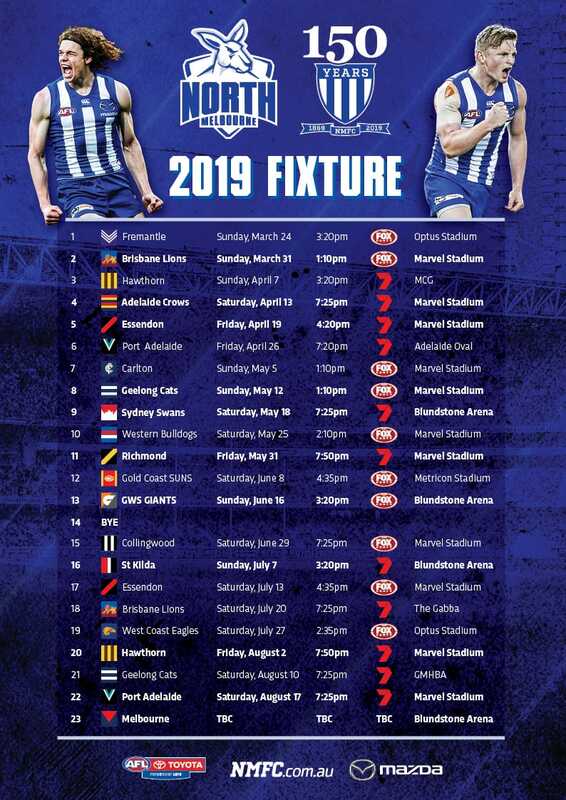 "Alex continues his career at North Melbourne after being on the AFL senior list in 2018. His speed, kicking, leadership and knowledge of the North Melbourne system will ensure he’s a valuable addition to the group." "Matt has experience on a VFL list and arrives with a terrific running base and will bring an adaptable and enthusiastic training consistency to the program." "Sam is a promising tall defender from Box Hill who has already proven to be a valuable member of the defensive mix in pre-season matches." "Nick is a prolific and decorated VFL footballer who brings terrific experience in the VFL. Despite his standing in the competition, Nick is looking forward to a new environment and improving his football even further. He’s been outstanding in his approach so far, culminating in his place in the leadership group and clear impact on the track. There will be an opportunity for exposure in some new roles on occasion, which will see Nick improve his football beyond his proven midfield career." "Dan arrives from the Sydney Swans and will add significant AFL experience and quality to the midfield group." "Mitch had a very good 2017 after suffering some injury setbacks previously. He’s a general defender, flexible in his role, defensively strong and possessing some excellent athletic traits. Mitch has plenty of improvement left in him, which will come with continuity and a continuation of his already impressive worth ethic and character." "Joey arrives from Perth FC in the WAFL. He’s a talented small forward/midfielder who has made significant gains in his short time with us so far." "Brendan has already brought to the VFL program his significant experience from Hawthorn and will be a valuable member of the team, coupled with his Development Coaching role."